← Can you pass this short financial quiz meant for teens? The “democratic political professional student” worked for U.S. Sen. Maggie Hassan (D-NH) and previously worked for Sen. Barbara Boxer (D-CA). He also previously worked or was an intern with the office of Sen. Dianne Feinstein (D-CA). As reported by NY Post: A former Democratic congressional staffer pleaded guilty Friday to federal charges after he posted leaked personal information about Republican senators on Wikipedia, then threatened a witness who caught him. 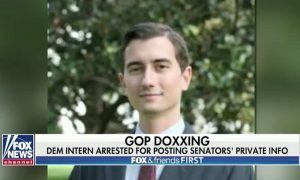 Jackson Cosko, 27, of the District of Columbia, pleaded guilty to five offenses related to his “doxing” the senators — uploading their personal information online — including computer fraud, making public restricted personal information, witness tampering and obstruction of justice. Prosecutors said he went after the lawmakers after one senator fired him and he got upset with the others while watching testimony on sexual assault allegations during Supreme Court justice Brett Kavanaugh’s confirmation hearings. His targets included GOP Senate Judiciary Committee members Lindsey Graham, Mike Lee and Orrin Hatch, as well as Mitch McConnell and Rand Paul. He faces nearly five years in prison when he is sentenced June 13. This entry was posted in Congress, crime, Idiots, liberal hypocrisy, Liberals/Democrats/Left, Media, Republican Party, Science & technology, Supreme Court, Taxes, Trump Derangement Syndrome, United States and tagged Barbara Boxer, computer fraud, Dianne Feinstein, doxing, Jackson Cosko, Justice Brett Kavanaugh, Lindsey Graham, Maggie Hassan, Mike Lee, Mitch McConnell, obstruction of justice, Orrin Hatch, Rand Paul, Senate Judiciary Committee, Wikipedia, witness tampering. Bookmark the permalink. Anybody care to bet this POS, Jackson Cosko, like Hillary, won’t be locked up? Well, if they don’t prosecute him these Senators should file personal lawsuits against him. Of course he probably doesn’t own a pot to pee in. What a little weasel. Just look at him. Actually, why are we surprised given the moral calibre of the DemonRats. He’s got that sweet, sophisticated look of a two-legged rat! I hope this yellow weasel rat gets the max! I wonder how many other demonrats have been doing this and haven’t gotten caught. Cosko has to go to jail to set a precedence and example. After looking at the smug look on this weasel’s face . . . I was taken away in my mind to think about the facial expression to be found on the face of Seth Rich, the former employee of the DNC who was gunned down in the street. He had a certain look of humanity. How very sad that the good do indeed die young. I’ve looked all over and I can’t find it anywhere else. I saw in Rivers’s site this morning and its gone now. I imagine its a hoax but everybody needs to dream.